Patrick Chan of Canada performs to "Concerto de Aranjuez" at the 2012 Four Continents Figure Skating Championships. If you weren’t a believer before, you have to be now. Reigning World Champion Patrick Chan decimated the competition in the men’s free skate at the 2012 Four Continents Figure Skating Championship, reinforcing the fact that he is the one to beat heading into next month’s World Championships in Nice, France. After opening with a beautiful quadruple toe loop-triple toe loop combination, it was easy for the Colorado Springs-trained Chan to trust himself. Though he appeared confident throughout his Concerto de Aranjuez program, Chan admitted to feeling the pressure of the competition. Chan’s practice aside, this competition was all him—he ended up with a competition total of 273.94 points which was nearly 30 points more than silver medalist Daisuke Takahashi. Takahashi had a disastrous start to his Blues For Klook program, two-footing the landing of his opening quadruple toe loop attempt and then popping an intended triple Axel. As the program progressed, however, the Japanese champion pulled himself together and finished strong. The silver medalist thinks that this competition is a good stepping stone for the World Championships, but realizes he has his work cut out for him if he wants to return to the top of the podium in Nice. Takahashi earned 244.33 points in the competition. Ross Miner jumped his way from sixth place after the short program to win the bronze medal by a little more than a point over teammate Adam Rippon, who finished in fourth. The U.S. bronze medalist skated with lots of speed, but struggled with some of the jumps—and even fell on a triple Lutz in the second half of the program. His performance still netted him 223.23 points, a new personal best. Rippon rebounded from a disappointing seventh place finish in the short program, and actually beat Miner in the free skate by less than a point. His total of 221.55 points was also a season’s best. Rippon opened with a quadruple Salchow attempt, but was able to complete it. Japan’s Takahito Mura, second after the short program, struggled throughout his program, and appeared to struggle with the high altitude in Colorado Springs. He faded to a distant fifth place, but managed a new season’s best 217.16 points in the competition. Kazakhstan’s Denis Ten also had issues with his free skate, but still managed his best placement in this competition—sixth. 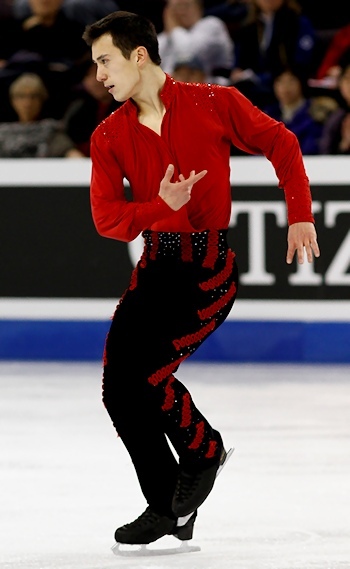 Japan’s third entry, Tatsuki Machida finished in seventh place, while Canadian Kevin Reynolds finished in eighth. Misha Ge from Uzbekistan and China’s Jinlin Guan rounded out the top ten in ninth and 10th, respectively.